Sleep apnea is a common sleep disorder that prevents the sufferer from getting the restorative sleep they need, night after night. Someone who has sleep apnea frequently stops breathing each night due to an obstruction in the airway--sometimes, up to 30 times per hour for severe cases. This causes the person to gasp for air when they do resume breathing and induces loud snoring. Sleep apnea is a serious medical condition that, if left untreated, can lead to dangerous medical consequences. Loud snoring is a common symptom of sleep apnea, but it’s important to note that not everyone who snores has this sleep condition. If you experience any of these symptoms, we suggest that you undergo a sleep study to determine if you have this sleep disorder. Every time a sleep apnea sufferer stops breathing it reduces the amount of oxygen circulating through their bloodstream, causing tremendous strain on the heart and other important organs. This is one of the main reasons why people with sleep apnea are at a higher risk of experiencing other medical issues. In addition, there are many medical conditions that can be made worse by the disorder, including obesity, ALS, Parkinson’s Disease, and Alzheimer’s Disease. Getting a full night of restorative sleep is important to live a healthy, thriving life. Sleep heals your body and give you the energy and focus you need to live each day to the fullest. This is why finding the right treatment for your sleep apnea is so vital. 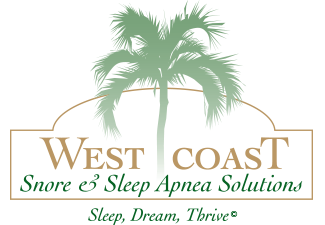 At West Coast Snore & Sleep Apnea Solutions, we offer a convenient home sleep test, or we can help you find a center that offers overnight sleep tests. We also offer a Self Sleep Evaluation on our website that uses the Epworth Sleepiness Scale to give you an indication of how well you’re sleeping. Once you have a diagnosis of sleep apnea, our doctors will work with you to find the treatment that works best for you. We offer convenient and comfortable custom-made oral appliances to treat your sleep apnea as an alternative to CPAP. We can also provide you with a temporary oral appliance that you can take home the day of your initial appointment and use while you’re waiting for your custom-made appliance. Contact us to schedule a sleep apnea evaluation at our Vista or Encinitas locations to get started on your treatment and your path to a better night’s sleep.